Annual list showcases the 20 Most Promising AWS Solution Providers 2015. C2S Consulting Group makes it to CIOReview’s top AWS Solution Providers list for its expertise in helping commercial and government companies with cloud computing and migration services. 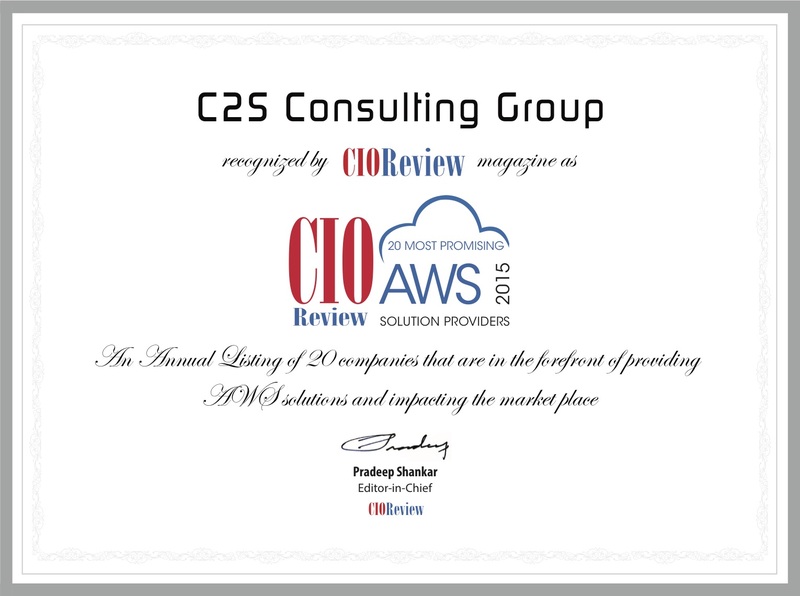 FREMONT, CA— September 15, 2015—CIOReview (www.cioreview.com) has chosen C2S Consulting Group (c2sconsultinggroup.com) for its 20 Most Promising AWS Solution Providers 2015. The positioning is based on the evaluation of C2S Consulting Group’s for its unique capability to demonstrate the advantages of cloud through their Innovation Lab that mimics a government or commercial setting to test customers existing software and applications when moved to the cloud. “C2S Consulting Group is honored to be recognized by CIOReview’s panel of experts and thought leaders,” said Sanjeev Newar, CEO, Brandee Daly, President and Founder, C2S Consulting Group. CIOReview constantly endeavors to identify “The Best” in a variety of areas important to tech business. Through nominations and consultations with industry leaders, our editors choose the best in different domains. The AWS Special Edition is an annual listing of 20 Most Promising AWS Solution Providers in the U.S.